To get to the root of the problem, Richmond Mayor Dwight C. Jones put together an anti-poverty commission, known as the Maggie L. Walker Initiative for Expanding Opportunity and Fighting Poverty, in 2011. Its goal: to reduce poverty in the city by 40 percent by 2030. But the commission wanted to look beyond the traditional methods. For years, state and local governments focused on workforce training programs and subsidies to entice companies to create jobs in low-income communities. Critics say such programs haven’t yielded their intended results. The U.S. poverty rate was 14.8 percent in 2014, the fourth year that it remained statistically the same. As a result, people are finding it nearly impossible to build assets and more and more Americans are being left behind, not only in communities of color and low-income communities, but increasingly among the white middle class as well. The good news is that when it becomes apparent that something isn’t working, new strategies and solutions get a closer look. That’s what a growing number of municipalities are doing as they lead the charge toward embracing economic development tactics built upon community ownership, such as worker cooperatives, social enterprises, and community land trusts. Local procurement efforts that use the power of money already being spent on services, supplies, and personnel to support businesses and workers from the local community are also being explored as a community economic development tactic. Here’s some of what’s working and how other municipalities can embrace these new forms of wealth creation too. One tactic that has received a lot of attention in recent years is the establishment of worker cooperatives. This model puts a democratic spin on business. Owned and governed by employees, cooperatives give workers a share in the decision-making process and the profits. As a result, employees not only tend to have a higher quality, more stable job in the short term, but as the business continues they also begin to amass assets in the form of their ownership stake. There are more than 300 worker-owned cooperatives in the United States, according to the U.S. Federation of Worker Cooperatives. They employ approximately 7,000 people and generate more than $400 million in revenue per year. New York City has been one of the staunchest supporters of this model, investing $1.2 million in its Worker Cooperative Business Development Initiative (WCBDI) in 2015. The money was distributed to 10 partner organizations and used to educate entrepreneurs about worker cooperatives, support the city’s existing worker cooperatives, spark the creation of new cooperatives, and help existing businesses convert to the worker-owned business model. According to a report released by the city assessing the first year of the WCBDI, 21 new worker cooperatives, with 141 worker owners, were created, nearly doubling the 24 that already existed. The new cooperatives include industries as diverse as travel planning agencies, cleaning services, and arts education companies. In addition, approximately 938 entrepreneurs received some type of education about the worker cooperative model. To build upon these successes, New York increased its investment in WCBDI to $2.1 million in 2016. New York has also passed a law requiring that municipal contracts awarded to cooperatives be tracked. Other municipalities have also thrown their support behind the worker cooperative model. 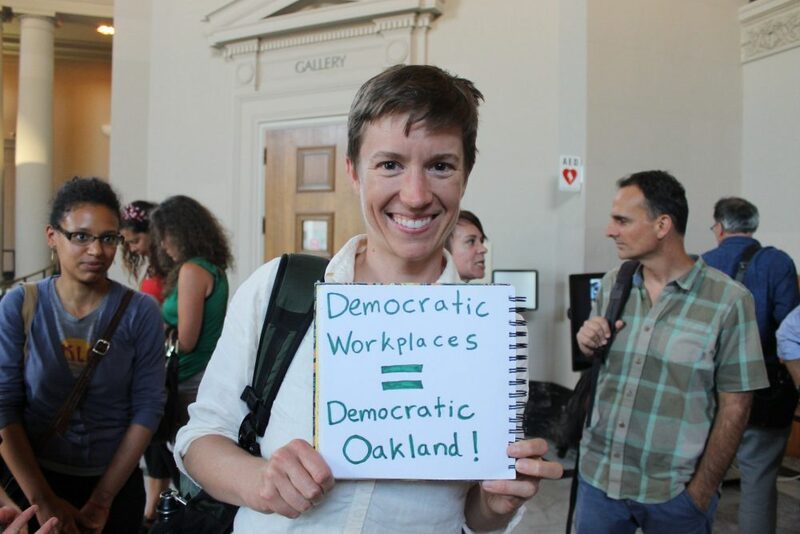 In 2015, the city council in Oakland, California, passed a resolution directing the city’s Business Assistance Center to provide resources to help entrepreneurs who want to start worker cooperatives or convert existing businesses to co-ops. In 2014, Austin, Texas passed a resolution to promote the growth and formation of worker-owned cooperatives that sell local products, and it promised to be a pilot city for the National Cooperative Business Association to launch a regional cooperative trade association. After Richmond’s anti-poverty commission published its results, the city decided to centralize all its efforts. “What they said is, ‘Hey, we have some serious areas we’ve got to work on. We’ve got to work on affordable housing, we’ve got to work on education, we’ve got to work on transportation, and we’ve also got to work on job creation in order to decrease poverty,” says Roots. That effort led to the establishment of the Mayor’s Office of Community Wealth Building. Another initiative involves the upkeep of the city’s public housing units. When people move out, the Richmond Redevelopment and Housing Authority typically hires five or six different companies to come in and prepare units for new tenants. Under one proposed initiative, the Office of Community Wealth Building would support not only training for residents but the creation of resident-owned businesses to handle the turnover of property from tenant to tenant. A third effort involves developing programs to help create worker cooperatives to offer home healthcare services such as transporting people to their doctor’s office and reminding residents to follow their medication regimen. Before all of that can be done, the city is looking to move its efforts beyond the walls of government by embracing a social enterprise model. Social enterprises can be nonprofit, worker-owned, or traditionally incorporated businesses that are created to generate social and economic change. With these efforts, Richmond hopes to bring back that pride and economic stability. The new frontier of community wealth building doesn’t stop at job creation. It extends to the way that cities think about homeownership. Community land trusts (CLTs) are community-controlled properties in which lower-income households can buy or rent homes at below-market prices, on land held in trust by a community organization. In return, buyers agree to restrictions that would limit how much they could sell the homes for. While owners would be able to build some equity in the home, the goal is to ensure that the house remains affordable so that another lower-income family would be able to buy it. The appeal of CLTs is that they take land out of the speculative market and protect it as a community asset, says Melora Hiller, CEO of Grounded Solutions Network, a national organization that promotes permanently affordable housing solutions. “In markets where the prices are increasing, to be able to have some permanently affordable stock in different neighborhoods means that no matter what happens around it there’s always going to be affordable housing there,” Hiller says. The CLT model also helps people retain wealth. It boasts an extremely low foreclosure rate partly because participating homebuyers get pre- and post-purchase counseling, and as the land owner, the CLT can and will often step in and help homeowners if financial challenges arise. There are many ways in which cities and counties can support community land trusts, says Hiller. They can set up CLTs themselves, or they can work with partners who set up and run CLTs by providing financial support or donations of public land. Some cities that have inclusionary housing ordinances partner with a CLT to provide stewardship of the affordable units generated by the ordinance, or might even put those units formally into a land trust. In some cases, community groups that want to establish CLTs are educating city officials about the model; in other cases, municipal officials want to start and manage CLTs themselves because they have a lot of city-owned properties that they would like to funnel into a program. Some cities look to forge partnerships with nonprofits to manage the CLT for them. In 2005 the city of Irvine, California, convened a Housing Task Force with the goal of creating an affordable housing strategy that would be effective over time. The solution they came up with was establishing the Irvine Community Land Trust. Its goal is to create 5,000 units of permanently affordable housing in the city by 2025. She has proposed legislation that would create a pilot CLT program with the input of residents, community organizations, universities, philanthropic foundations, and the county Department of Public Housing and Community Development. “The goal of the pilot program would be to create 100 units of housing that would remain affordable in perpetuity,” Levine Cava adds. The proposed legislation was inspired by a research-based community action plan called “Prosperity Agenda for Miami-Dade” that was developed by Florida International University’s Metropolitan Center and Citi Community Development to come up with wealth-building strategies that would have a lasting effect in the community. As cities and counties experiment with community ownership models, other municipalities can learn from and be inspired by their successes. However, there is no one-size-fits-all approach to community wealth-building. “Every city is different, so there’s no replicable model that works the same in every city,” says Sarah McKinley, manager of community development programs for Democracy Collaborative, a national organization focused on building community wealth. One of the first steps a municipality should take is figuring out who in the community can unite all stakeholders, including local government, nonprofits, and community organizations. “It’s really important to have that inclusivity, working with and bringing to the table the communities of color, the low-income communities that have been deliberately left out of our economic growth over the past couple years, and making them part of the solution,” McKinley says. For example, in many cities across the country, there are baby-boomer business owners who are nearing retirement. If these entrepreneurs don’t have children who are readily able to take over the business, they may decide to sell or simply close the business when they retire. But those same business owners could help the local community by selling their companies to their employees. “How can we take advantage of opportunities of those business owners retiring to convert some of those enterprises to worker ownership, so that the workers instead own the business and get a share moving forward?” McKinley asks. Cities can help bring that about by working with their local chambers of commerce, for example, to identify businesses whose owners are nearing retirement. They might also pass legislation to make it easier to convert businesses to worker cooperatives. Another way that cities can support new wealth-building strategies is by modeling the behavior that they want to encourage, says McKinley. Even a modest increase in the number of city contracts and purchases that go to worker cooperatives or local companies can advance the conversation around community wealth-building. The impermanent nature of local governments can be a challenge to their leading this kind of long-haul change. One administration might be all for supporting worker cooperatives or CLTs, while the next one might think it’s a terrible waste of resources. One way to ensure that efforts have the time and commitment necessary to yield results is to separate them from one particular administration. When Richmond’s Office of Community Wealth Building was first developed, it was part of the mayor’s office, which meant that it could be dissolved as soon as the next mayor came on board. However, in January 2016, it was instituted as an independent office, “so now we’re part of the fabric of city government,” Roots says. Time will tell how successful these new models of wealth creation ultimately are, but it’s clear that the nation’s cities are in dire need of more-inclusive approaches to community development. “We’re only as good as the rest of our community,” McKinley says. “We have to make sure that those communities that have been left out are included in the process so that you’re not perpetuating the sort of inequalities and divides that have gotten us where we are right now. Keep in mind, “economic development” & business development are one & the same thing. Why is “economic development” limited in corporate/business terms? After all, “economic development” is a public term, hence, we need public outcomes, in socioeconomic terms. Business activity is private activity, hence the metric here is net profits. Who is fighting for these public goods we’re seeking? Why are public officials doing the work of the Chambers of Commerce, whose mission in life is to promote the private sector? This is a reflection of “urban” planners focusing on the built environment, rather than using CED planners to focus on human capital outcomes. Basic planning terms are misunderstood, & as a result, we mix apples with oranges. To make matters worse, we have no real transparency nor accountability; I have much more to say, but I’ll stop here. Thanks. I must correct one mistake made earlier in my comments: “economic development” & business development are NOT one & the same thing.